ROGER USED TO SAY that the Oscar awards season was like the Christmas season for Santa. And we used to anticipate it with all the joy of Christmas. 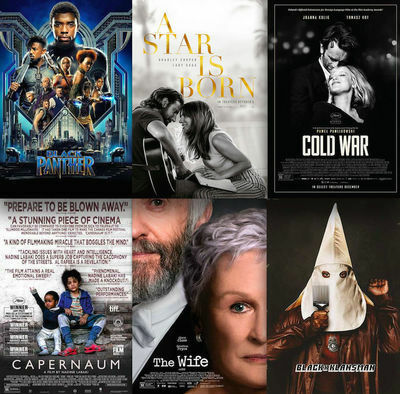 These days there are so many awards shows even before the Oscars, that it not quite as heightened, but it is still something I look forward to with great relish. Yesterday morning, however, it felt as if I had traveled back in time. I had gotten up early to watch the Oscar nominations announced live, as I annually do, and amidst all the excitement and well-deserved recognition, there was a distinct pang of disappointment. When the category for Best Documentary Feature was revealed, I was saddened to see Morgan Neville's "Won't You Be My Neighbor?" not among the five nominees. Not only was it the most popular and profitable documentary of 2018, it embodied the empathetic philosophy of its subject, Fred Rogers, a trailblazing television friend of countless children. Watching this documentary brought me back in touch with just how much of a visionary Mr. Rogers was about the human condition, and the fact that in the end, there is only love. He was a compassionate subversive wrapped in the disarming cotton candy of a children's show. In many ways, the Oscars' failure to nominate this film reminded me of when "Life Itself," Steve James' widely acclaimed and beloved film about my husband was snubbed four years ago. This is after both films won many critics' and other awards, including the Producers Guild Award for Best Documentary. That being said, I couldn't be more thrilled for the five films that did end up getting nominated, especially "RBG," Julie Cohen and Betsy West's stirring tribute to Supreme Court Justice Ruth Bader Ginsburg, as well as two debut features I had the pleasure of giving awards to when I was on the Documentary Jury at the Sundance Film Festival in 2018, RaMell Ross' "Hale County This Morning, This Evening" and Bing Liu's "Minding the Gap." I am so excited to see these remarkable talents going the distance, and I will be cheering them on during the Oscar telecast on Sunday, February 24th. Each filmmaker has a fresh and distinctive voice that makes you excited to see whatever they happen to do next. Despite 2018 being an extraordinary year for female filmmakers, not one of them was nominated in the Best Director category. However, I was happy to see Nadine Labaki included in the Best Foreign Language Film category for "Capernaum," a staggering Lebanese drama about a 12-year-old boy who sues his parents for "divorce" after their desperate actions of neglect result in unthinkable tragedy. The performances by young Zain Al Rafeea and toddler Boluwatife Treasure Bankole are among the greatest by children in cinema. Labaki's film was one of two favorites I had at the Cannes Film Festival, the other being "Cold War," the latest swooningly romantic work from Polish auteur Pawel Pawlikowski. The film received a total of three nods, including Best Director and Best Cinematography. Of course, leading the Foreign Language nominees this year is another black-and-white gem, Alfonso Cuarón's "Roma," wherein the filmmaker recreates the Mexico City of his youth, juxtaposing the intimate story inspired by his family's housekeeper (Yalitza Aparicio) with the political turmoil engulfing the nation. Both first-time actor Aparicio and veteran Mexican star Marina de Tavira earned acting nods, enabling the film to tie with Yorgos Lanthimos' delightfully strange "The Favourite" for the most nominations: 10 apiece. Though the Best Actress category is incredibly strong, I truly believe this will be the year of Glenn Close. This is the revered performer's seventh Oscar nomination, and her portrayal of a housewife living in the shadow of her husband (Jonathan Pryce) in Björn Runge's "The Wife" will very likely earn her the accolade. I was also delighted to see Regina King in the Best Supporting Actress category for Barry Jenkins' "If Beale Street Could Talk." In addition to Best Picture nominees "Roma" and "The Favourite" is Bradley Cooper's reimagining of "A Star Is Born," which made for one of the most romantic movie experiences of 2018. Here's hoping two of the year's most historic nominated films become winners on Oscar night: Ryan Coogler's "Black Panther" (with seven nominations) and Spike Lee's "BlacKkKlansman" (with six). Coogler's Marvel blockbuster was the highest-grossing film of 2018, and has now become the first superhero picture to earn a Best Picture nomination. My one regret is that Michael B. Jordan didn't get a deserved nomination for Supporting Actor. In "BlacKkKlansman," Lee's witty yet bracing telling of a true-life tale takes the audience full circle from the 1970s, when a black policeman (John David Washington) infiltrated the Ku Klux Klan, to the increasingly outward displays of racism in our modern world. This film has earned Lee his first Oscar nomination for Best Director. If he wins, he will become the first African-American filmmaker in history to triumph in this category (Roger Ross Williams was the first African-American director to win an Oscar, though it was in the category of Best Documentary Short Subject). Please Oscar voters, Do The Right Thing! To see the complete list of nominees for the 91st Academy Awards, click here.